The Youth of the Greater Roseau area, together with the Roseau Improvement Committee Inc. (RIC) staged its 20th Mother's Day lunch and entertainment event dubbed "A Love Affair of Pure Youth Expression" on May 12th at the Harlem Plaza, New Town, Letricia Cadette reports. 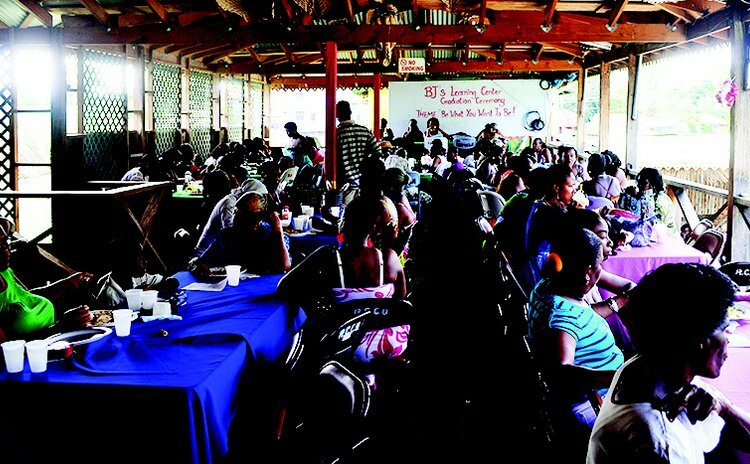 The event which in the past had been concentrated towards providing Mothers within Roseau Central with a celebratory lunch and awards presentation took on a different feel this year with mothers being treated to a live entertainment presentation by the youth of Roseau and environs. After lunch, Mothers were serenaded with music and song by groups the likes of 911, a budding group from Roseau North, Musik Spell Entertainment out of Grand bay, Danny Lugay from Roseau North, Colton T, as well as with poetry by the first runners up in the 2011 Miss Dominica Pageant, Ameka Cognet, and Ms Ndala Mills; and dance by individuals and groups including young D'sihre, the Pointe Michel Cultural Group, led by Joan Frampton, and the Bois Bois Dancers. The mothers were graced by a visit from our reigning Carnival Queen, Ms Leslassa Armour Shillingford. Over 180 mothers from the greater Roseau area, Roseau Valley and Pointe Michel, were treated to a sumptuous lunch prepared by some of the leading hotels and restaurants in the Roseau area, and an afternoon of Youth Expression of Pure Love.